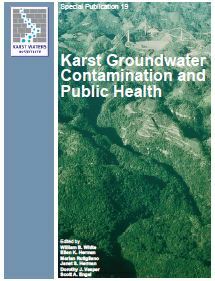 This electronic publication is Special Publication 19 from the Karst Waters Institute, consisting of abstracts and an associated field guide for the Karst, Groundwater Contamination, and Public Health symposium held January 27 through 30, 2016, in San Juan, Puerto Rico. The conference was co-sponsored by Karst Waters Institute, Puerto Rico Testsite for Exploring Contamination Threats (PROTECT), NSF, NIH, and the Edwards Aquifer Authority. Case studies have demonstrated that the movement of contaminants in karst aquifers is poorly, if at all, predictable. On one hand, contaminants may travel rapidly through the aquifer due to direct input, open pathways, and high flow velocities. In contrast, under other conditions, contaminants may be stored in the aquifer for long periods of time and gradually released at low concentrations. There have been a substantial number of studies of the movement of specific contaminants in specific aquifer locations – case studies – but much less consideration of more generalized concepts of contaminant injection, storage, transmission, and release. More importantly, much less attention has been given to the actual impact of contaminated karst aquifers on public health. Given the importance of karst aquifers as water resources worldwide, it behooves us to consider (1) how contaminant movement differs in karst aquifers and (2) what is the consequent threat to people who use these waters? Conference Proceedings and Field Guide (2016). ISBN 978-0-9789976-8-7. Electronically published and soft copy. 74 pages, Color cover and figures. Recommended Citation: White, W., Herman, E., Rutigliano, M., Herman, J., Vesper, D., and Engel, S., Eds., 2016, Karst Groundwater Contamination and Public Health. Selected papers and abstracts of the symposium held January 27 through 30, 2016, San Juan, Puerto Rico. Karst Waters Institute Special Publication 19, Karst Waters Institute, Leesburg, Virginia, 74 p.